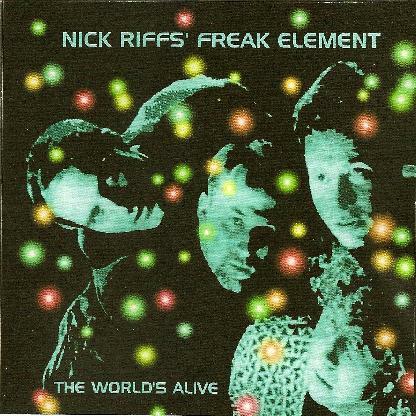 Nick Riff's Freak Element - "The World's Alive"
"The Hidden Path" kicks off the set, an intense rocking intro piece with chants, looped liquid guitar, and all around psychedelic swirl that builds momentum. This leads into "Calling You", a heavy spaced out psych rocker with wailing trip guitar licks and blasts of alien electronics. It's got a relentlessly pounding stoner-garage beat and I really dig the mixture of crashing guitar chords and tasty solo bits. "Into It" is an outstanding psych rocker and damn good song and features more luscious freak guitar and synth bits. Nick does a hell of a fine job of writing catchy songs while taking them deep into the psychedelic cosmos and working in lots of instrumental stretching out within the space of 5+ minute songs. "The World's Alive" is another excellent rocker with a pop-psych edge and a great 60s feel, both musically and lyrically. On "Hovering Just Overhead" we get deep into garage rocking SPACE. It's a pounding rocker with space guitar efx that remind me of Farflung, and voice samples from some 50s sci fi flicks. "Same Thing Twice" is an acidic space rocker with song elements and lots of totally stoned jamming. "Pre-Millennium Transmissions" features 9 minutes of pure instrumental space exploration. Great drumming really adds oomph and direction to this effects fest. And "Dream" is a peaceful, seductive, melodic psychedelic space rock song that's ends the album on a meditative note. I'm glad this album is finally seeing the light of day. Highly recommended! Nick has a solo album he recently completed so I hope that gets out soon. For more information you can visit the Nick Riff web site at: http://www.nickriff.com.